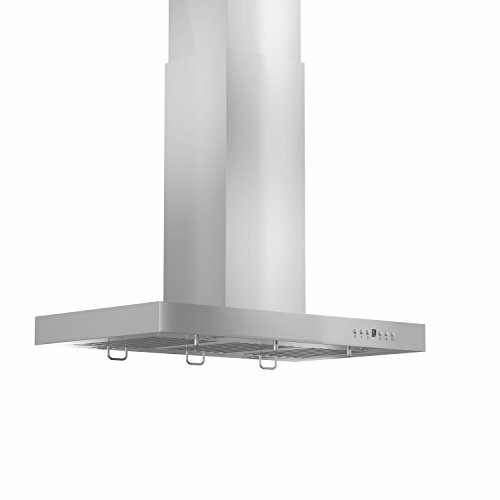 ZLKE248B Size: 2.7" H x 48" W x 21" D Features: -Material: Stainless steel. -Number of lights: 4. -4 Speeds. Product Type: -Wall mount. Finish: -Stainless steel. Primary Materials: -Stainless Steel. Lights Included: -Yes. Dimensions: -6" Outlet. Size 2.7" H x 30" W x 21" D - Overall Width - Side to Side: -30". Size 2.7" H x 30" W x 21" D - Overall Product Weight: -60 lbs. Size 2.7" H x 36" W x 21" D - Overall Width - Side to Side: -36". Size 2.7" H x 36" W x 21" D - Overall Depth - Front to Back: -21". Size 2.7" H x 36" W x 21" D - Overall Product Weight: -65 lbs. Size 2.7" H x 42" W x 21" D - Overall Height - Top to Bottom: -2.7".